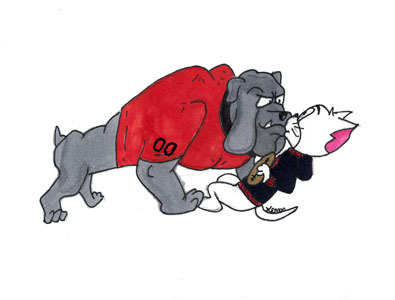 A nervous Deming Wildcat finds itself face to face with an Artesia Bulldog in this drawing by Artesia High School senior art student Maegan Lemon. The ‘Dogs will take on the ‘Cats at 7 p.m. today. After spending the first three weeks of the 2017 season in their own backyard, the Bulldogs will no doubt learn a little more about themselves this week. There’s nothing quite like a long road trip to promote bonding between players and provide a taste of a playoff-type atmosphere, where forays into unfamiliar confines are often common. But there’s also nothing like it to leave a squad stiff and sluggish, and like any, the ‘Dogs have struggled through their share of “bus lag” in the past. Because of that, head coach Rex Henderson and his staff will be looking for their athletes to shake it off quickly Friday and come out firing against a Deming team that’s poised to pose a challenge. “One of the big keys this week is how we handle the road trip,” Henderson said today. “We get to do this several times, but this is the first one, and sometimes this trip has been a tough one for some of our kids. We haven’t always come out and played as sharp early on against Deming, so I think this is going to be a good opportunity for us to make sure we’re able to get off the bus and go play ball. The ‘Dogs (2-1) are coming off of a lopsided 55-0 Homecoming win over Valencia last week that saw Artesia end the bout in the third quarter. That turned out to be a welcome opportunity to rebound after the team suffered its first loss Sept. 1 to Hobbs. The boys in orange were able to flex their muscles in all three phases against the Jaguars, and that confidence boost should carry over into tomorrow’s Class 5A outing, as should the strides the team made in maintaining their rhythm. “Consistency in our execution is still the main thing,” said Henderson. “On offense, throwing the deep ball is still a continuing goal for us. We’re doing pretty well with everything else, but that’s one thing we have to be more consistent in. Deming (2-1) will be looking to bounce back from their first loss of the year last Friday to El Paso Burges. The Wildcats took the role of the aggressor early on in that bout in Deming, scoring on their first play from scrimmage as back Tony Mariscal III took the handoff 80 yards to pay dirt. With around five minutes to go in the opening quarter, wide out Rylan Larko took a Daniel Garcia pass to the end zone from 74 yards out to put the ‘Cats up 14-0. Burges was able to log a pick to spark their first scoring drive in the second quarter, however, and quickly pulled back within a pair, 14-12. And although Deming’s Aaron Alvarado answered with a 70-plus-yard kickoff return for a TD, the Mustangs would tie it at 20 prior to the half, then turn their passing game loose in the final 24 minutes to pull away for the 47-26 win. The Wildcats return three starters from 2016 on each side of the ball, including backs Mariscal and Trini Garcia III in both phases. In total, Deming has eight two-way starters. Trini Garcia was 15-45 rushing against the Bulldogs a year ago, and 5’11”, 155-pound junior quarterback Daniel Garcia steps in to provide the balance to a Wildcat offense that attempted just a handful of passes for 31 yards in 2016. Meanwhile, on defense, Wildcat sophomore safety Ceazer Chavez finished third in the Class 5A 100-meter dash finals as a freshman in May. “They’ve got a lot of young kids playing since most of the guys that played a year ago were seniors,” said Henderson. “They’ve got some good athletes in some of the skill spots, and they’ve got some really big linemen, so it’s definitely a team you can’t take lightly.